The 2013 Lexus GS350 F Sport is a premium luxury sport sedan fitted with all of the amenities and features that a car claiming to be both luxury and sporty should have – with these attributes combining to create a roomy sedan that is a blast to drive while also being packed to the roof with the greatest of creature comforts. I spend a great deal of time driving different vehicles so when a friend of mine saw that I was driving the 2013 Lexus GS350 F Sport, he asked how it was. He commented that the Lexus line has come quite a ways but he asked if it was still “grandpa’s luxury car”. In speaking with a handful of other people who had not been in or around the new GS350 yet who are automotive enthusiasts, it seemed that this misconception of Lexus being an old man’s luxury brand was a popular one. Having had the chance to spend time with the GS350 F Sport on a race track and in the rigors of daily driving – I am here to tell you that the GS350 F Sport is a far cry from your grandpa’s luxury car. Sure, there was a time where the Lexus brand was little more than a collection of dressed up Toyota models and for those looking for a reliable, quality luxury vehicle – the older Lexus GS lineup was surely a popular choice for those older buyers who want the quality of a Toyota with a higher level of luxury. However, as the Lexus brand has progressed over the past decade, this is a brand that has gone to great lengths to build more engaging vehicles – an effort that is very clearly displayed with the 2013 GS350 F Sport. 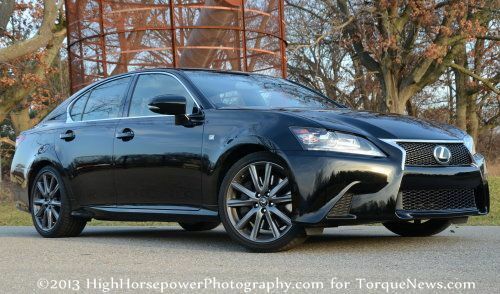 The 2013 Lexus GS350 F Sport shares much of the same styling cues that we see on the non-F Sport models which provide a very sporty, aggressive look without any additional features but the F Sport package does add a few items around the exterior to make this package even sportier than the entry level GS350. Up front, the massive spindle grille is trimmed in chrome but unlike the non F Sport models, this package has the upper and lower fascia openings filled with black mesh rather than the horizontal bars on the other models. Also, the lower fascia area is wider and reaches further to the ground with the standard fog lights of the GS350 removed to make room for large, angular ducts that give the F Sport sedan a much meaner look. In addition to the unique grille filler and lower front fascia, the GS350 F Sport sports the same HID projection headlights as the rest of the lineup with LED light bars running along the lower edge of the sharply angled headlight housings. Standard across the entire 2013 GS lineup, these headlights improve the aggressive feel of the F Sport when combined with the F Sport front bumper. Along the sides, the 2013 Lexus GS350 F Sport doesn’t differ much from the rest of the GS lineup shy of the F Sport badges and the unique dark graphite 19” wheels with a split spoke design, wrapped in high performance rubber. While the F Sport package doesn’t offer much in the way of changes from the non-sport model GS sedans, the natural shape of the 2013 GS350 caters to the sporty nature of the F Sport package. The long hood area, gentle windshield angle, low and flat roofline, the fast rear glass and the short trunk lid give the GS350 a very slippery feel with just enough angles around the wheel openings to break up the fluid design of this luxury sport sedan. Much like the front end, there is a minimal amount of chrome with only the side glass being trimmed in bright silver but that is just enough to remind us that the GS350 F Sport is still a luxury model – although there is a clear sport direction with the overall exterior design. Out back, the 2013 Lexus GS350 F Sport wears a unique lower fascia area with an integrated diffuser and dual integrated exhaust tips finished in stain silver. The most powerful feature of the GS350 rear end is the big, bright LED tail lights that wear the unique “L” design in the lenses that almost give the back end an angry look – further bolstering the aggressive nature of the F Sport package. Whether these tail lights are lit up or not, they look great and go a long way in giving the 2013 GS350 more attitude. The 2013 Lexus GS350 F Sport doesn’t feature a great many features that helps to differentiate it from the rest of the 2013 GS sedan lineup but there is just enough done to this sleek sport sedan to help it stand out in the crowd. The design of the entire GS sedan lineup looks great thanks to the obvious sports car attitude but the F Sport takes that one step further - presenting a more aggressive look without straying from the luxury nature of the Lexus brand. Inside, the 2013 Lexus GS350 F Sport is very clear a fully loaded luxury sedan with features that bolster the performance oriented aim of the F Sport package. Like the rest of the Lexus lineup, the GS350 F Sport is loaded with black leather on the dash, door panels, seats, steering wheel, shifter and center console while contrasting white stitch work throughout the cabin work with the brushed silver accents on the doors, dash and center stack to give the GS350 a very upscale look and feel. The perforated front seats offer both heating and cooling coupled with full power adjustments but as a part of the F Sport package, the driver’s seat offers an incredible 16 way adjustment system. The driver can adjust literally every part of the seat, from the angle of the side bolsters to the length of the front seating pad to all of the basic directions of your average power seat. This allows the driver to adjust the seat in every way for complete customization and in my experience, this driver’s seat offers an unbeatable level of comfort whether the driver is 5’1” or 6”8”. Even those seats around the cabin that do not have 16 way adjustment are still very comfortable on either a long drive or a blast through some twisty back roads. Best of all, the amount of space for both passengers and cargo is surprising for a midsized sedan with tons of room for four tall adults and room in the trunk for several large boxes. Like the other Lexus models, the 2013 GS350 F Sport features the control system mounted on the center console just past the end of the central arm rest which operates on a similar design of a computer mouse. This scroll, point and click control system works with the massive 12.3” infotainment screen that is mounted high on the dash with a readout of everything in the vehicle – from navigation to the phone system to the premium sound system to the HVAC controls. The GS350 F Sport also offers traditional knobs and buttons on the center stack but the Lexus control interface is so seamless and so user friendly that even those drivers who have no experience with high tech interior gadgets will be able to learn to love this system in a hurry. A similar system to this one is used in the entire Lexus lineup and in my opinion; this is one of the best infotainment control interfaces in the industry today. The 2013 Lexus GS350 F Sport interior looks great and feels great with very little left to ask for in terms of amenities. This is an interior that you have to experience for yourself in order to really appreciate the level of comfort and of craftsmanship that went into the plush cabin of this performance oriented midsized luxury sedan. The 2013 Lexus GS350 F Sport is powered by the same 3.5L V6 found in the other GS350 models, packing 306 horsepower and 277lb-ft of torque. This power is sent to the rear wheels (AWD is available as well) via a 6-speed automatic transmission that can be controlled very well via the steering wheel mounted shift paddles or with the shifter on the center console. All GS350 models are equipped with the Drive Mode Select system with Eco, Normal and Sport driving modes but the F Sport package adds the Sport+ mode as well. Eco alters throttle input and output to maximize efficient while Normal is a mode that balances sporty driving characteristics and fuel economy. Sport mode allows for increased throttle response and alters the shift points and shift characteristics for improved performance and the unique F Sport “+” mode also makes the steering system more responsive while also adjusting the Adaptive Variable Suspension system to improve the handling of the GS350. Without a doubt, Sport+ is my favorite drive mode as this selection provides the best acceleration, the most positive steering and the stiffest/most capable suspension tune – all of which make the GS350 F Sport a total blast to drive. The stiffer suspension of the Sport+ mode makes a big difference in handling and “road feel” but at the same time, it doesn’t stiffen up the suspension enough to be unpleasantly rough. Finally, the massive F Sport brake package might not make a big difference under normal driving situations, when you get to hammering the turns hard, these big brakes will bring this sleek sedan to a stop in a serious hurry. Thanks to the folks at Lexus, I was able to spend time behind the wheel of the 2013 GS350 F Sport both on the open road as well as on a small, tight road course. While this is a midsized sedan that will very comfortably seat 4 adults, setting the Drive Mode to Sport+ will allow you to toss the GS350 through both high and low speed corners with a great deal of confidence. The race course included a tightening slalom, a series of mid speed S turns, a series of high speed turns and a couple straights that allowed the GS350 to flex its muscle. I expected that the GS350 F Sport would be fun to drive on this road course but I was totally blown away at just how well this luxury sedan handled itself on the turns regardless of the speed and type of turn. Through the tight turns, the GS350 F Sport offered just a touch of understeer at the nose would push out a bit if you got overzealous in the S turns and slalom while on the longer sweeping turns at high speed would bring about a touch of drifting fun as the back end would willingly walk out with a little extra throttle input. Finally, the steering wheel mounted paddle shifters make shifting for ideal performance a snap and unlike some paddles on the market today – the Lexus setup offers a great deal of control over the precise shift times. The GS350 F Sport handled great on a road course and while I would guess that there aren’t all that many GS350 buyers looking to use their Japanese luxury sedan as a weekend race car, those driving characteristics transfer very well to real world driving. The GS350 F Sport will cut through the twisty country roads very comfortably at higher speeds while being very capable of climbing to the quoted 144mph top speed of the entire GS350 lineup. While 306 horsepower may not seem like all that much in an era where many sports cars are nearing (or over) the 400hp mark but the GS350 F Sport makes great use of the available horsepower, dashing from 0-60 in the mid 5 second range while also packing enough power to blast around slower moving traffic on the highway. In the event that you are driving the Lexus GS350 F Sport in a nice, calm manner, the cabin is whisper quiet even on the rough highways of the Detroit Metro area so while this sport sedan will perform like a sports car, it also provides a quiet, smooth ride that you would expect of a proper luxury sedan. Very little road noise transfers into the cabin even when you are in the Sport+ mode while having the windows and sunroof closed cut out any hint of wind even when you are cruising at highway speeds. The 2013 Lexus GS350 F Sport is a luxury sedan with a performance oriented package – one that makes this roomy midsized sedan a great deal of fun to drive. While this car delivers all of the ride quality and interior noise prevention that you would expect from a modern luxury car, the GS350 F Sport has the spirit of a sports car hiding under the skin and when you pop the Drive Mode selector into Sport+ mode, this is a car that provides as much “fun to drive” factor as a great many 2-door sports coupes available in the US today. Best of all, the GS350 F Sport is a beautiful car to drive with real room for four adults and tons of room in the trunk. There was a time when classifying a Lexus midsized sedan a great sports car would have been little more than a joke but the 2013 Lexus GS350 F Sport shatters any and all of those “old man luxury car” misconceptions about the Lexus lineup. The GS350 F Sport handles like a sports car, it stops like a sports car and even with the fuel friendly 3.5L V6 engine – the new GS350 accelerates as positively as many of the pure sports cars on the market today. Many luxury sport sedans draw the reaction of “yeah…it’s pretty sporty” where the Lexus GS350 F Sport is sure to draw a collective “wow!” from anyone in the car during a spirited drive. By the way, the GS350 F Sport will do big smokey burnouts - or so Ive been told. There are a great many luxury sport sedans available in the US market but few of them can fulfill the promise of both premium luxury and sporty driving characteristics like the 2013 Lexus GS350 F Sport. This is a midsized sedan that offers an incredible amount of space in the cabin and in the trunk with a show stopping interior spread that features every option that you can ask for in the luxury segment today. More importantly, once Lexus made sure that this car had all of the credentials of a proper luxury sedan, they fitted it with a drivetrain, suspension, steering and braking system that allows this sleek sedan to accelerate swiftly, hammer the hardest corners with ease and stop on a dime – while looking great doing it. The 2013 Lexus GS350 F Sport packs loads of style and all of the mandatory creature comforts that makes this a great car for taking the family on vacation or for picking up a group of coworkers for a ride to a business meeting – with the interior layout being as impressive to your associates as it is to your family. Lots of luxury sedans available today can offer that level of interior quality but the Lexus GS350 F Sport offers more fun to drive factor than comparable models from the big German luxury brands. Also, with a price of $55,869 as tested with pretty much every item available for the GS350 F Sport added, this luxury sport sedan is less expensive than comparable German luxury sedans. The entire Lexus brand has made great strides to be a sportier, more aggressive and more fun to drive luxury brand and the 2013 GS350 F Sport is a beautiful culmination of those efforts. If you want a true luxury car that makes good on the promise of being a sport sedan – the GS350 F Sport could be your next new car. It will be interesting to see if the new IS350 F Sport is able to hit the 5 seconds flat mark with the new 8 speed from the IS F. It will need to be somehow more sporty than this car. They share the same engine and both are reard drive. Great review.